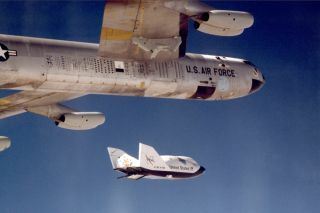 The X-38 research vehicle drops away from NASA's B-52 mothership during a 1999 test flight. In this historical photo from the U.S. space agency, the X-38 research vehicle drops away from NASA's B-52 mothership immediately after being released from the B-52's wing pylon. More than 30 years earlier, this same B-52 launched the original lifting-body vehicles flight tested by NASA and the Air Force at what is now called the Dryden Flight Research Center and the Air Force Flight Test Center. NASA B-52 Tail Number 008 is an air launch carrier aircraft "mothership," as well as a research aircraft platform that has been used on a variety of research projects.